Your coffee or tea area is like your fuel station. It’s the destination for your daily ritual of grinding coffee, steaming milk, and plopping a tea bag into your cup of perfectly hot water. Make your station a shrine to your favorite hot or iced beverage. Making a picture-esque kitchen coffee and tea station is easier than you think. Plus, you barely have to spend any money. It’s all about coordinating everything together to create a cohesive space. One of the things this space will need is wall art. Check out this list of cheap wall art for your kitchen coffee and tea station and pick the one that works for your home! We’re starting off with a familiar piece of coffee culture. 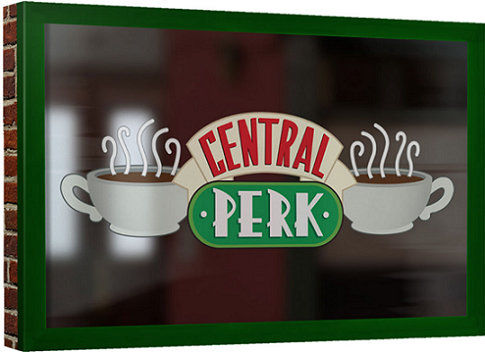 Pay homage to the everybody’s favorite 90’s television sitcom Friends and choose the super cool Central Perk Wall Art canvas from RetroPlanet (they’ll usually have promo codes for 10 – 25% off, plus other discounts available). Now crowd around, Phoebe is about to perform Smelly Cat! 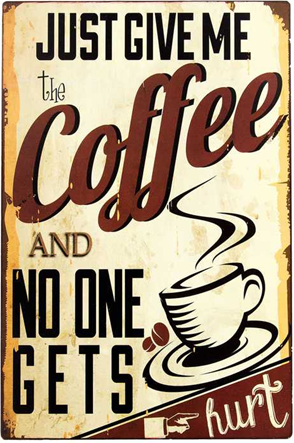 A rustic metal sign is a great way to add a café coffee shop style look to your station. Not only that, but you get a little humor with it. The Give Me the Coffee and No One Gets Hurt sign from Hobby Lobby will be a fair warning for people to hand over the java. Plus, Hobby Lobby is always, and we mean always, offering a 40% off one item promo code, and sometimes even other codes as well. The brown and burgundy color scheme makes it oh-so cool in that coffee shop way. It comes with two sturdy hangers in the back, so hang it up on whatever wall fits best. Another Hobby Lobby winner is the Rusty Black Stacked Tea Cups. This one is for people who prefer tea rather than coffee (although it can still pass for coffee lovers). 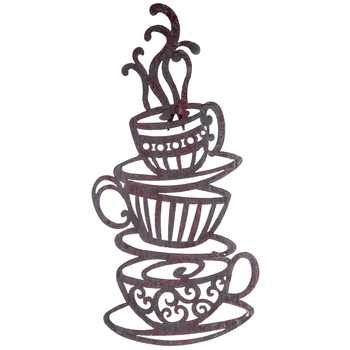 This cute design brings a victorian style to your kitchen coffee and tea station for only $10.99. It’s lightweight, so it hangs up easily. First things first. Reign in the way with your favorite cup of coffee and the But first…Coffee wall art. 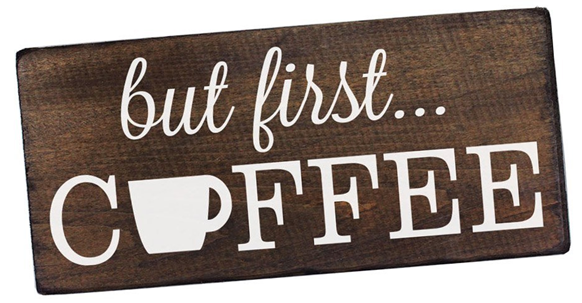 This piece makes the perfect choice for cheap wall art for your kitchen coffee station. This wall art is more for people that prefer wood. The dark stain beautifully contrasts the white lettering and will go great on any colored or plain white wall. It’s simple yet says so much. Before you start your day…you’ll need coffee. For only 6 bucks, you can get one of the most classy looks out there on Etsy. 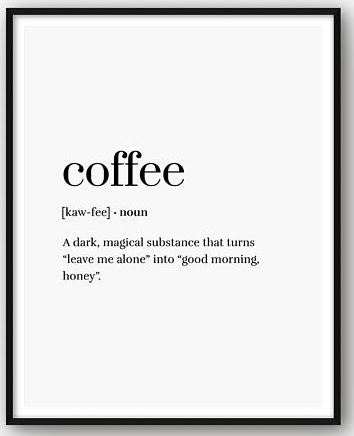 The Coffee Definition Poster spells out exactly how amazing coffee is. If you love the idea of making a special coffee station, but you aren’t into the rustic browns and distressed vibes of the café look, then this is a sophisticated choice. This piece neatly expresses the joy of drinking the “dark, magical substance” without messing up the flow of your home. Add a lush splash of green to your coffee and tea station. The Tea and Coffee Botanical Art pieces (also on Etsy) are delightful. 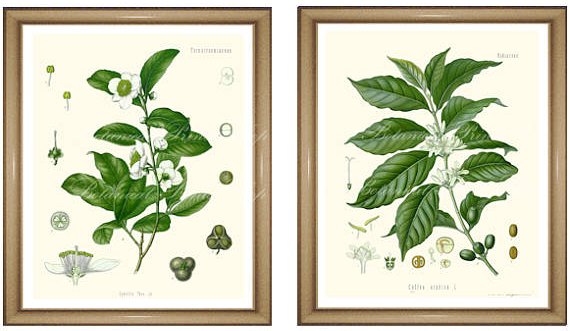 The pair of art pieces show the tea plant called Camellia sinensis and the coffee plant Coffea arabica. It’s similar to the dainty and delicate artistry you’d see on a pack of flower seeds. Talk about gorgeous. The Best Coffee and Tea Co. piece from iCanvas uses a brick look with western style lettering. 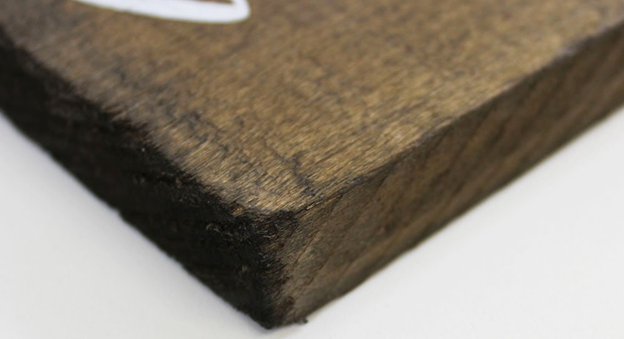 It’s made with 100% North American Pine wood stretcher bars and “industry leading archival UltraChrome® Giclée inks to achieve the most vivid and high-definition prints possible.” This one’s a keeper (iCanvas promo codes here & here). Perhaps no words are needed. Get that french café feeling by simply hanging an image that says it all. 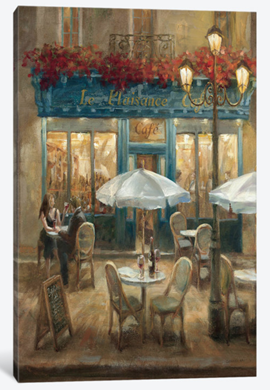 The Paris Cafe wall decor piece, also from iCanvas, takes you away on a Parisian vacation. Play make-believe and imagine sipping a bold roast espresso before grabbing your daily baguette. Let’s think outside the box. Wall art doesn’t have to be an art piece – it can be stickers! 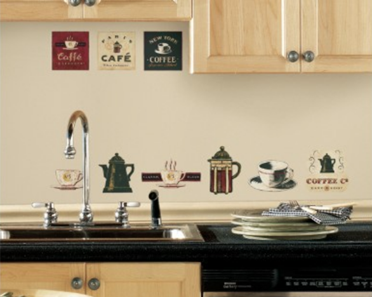 Wall decals can make cheap yet cute wall art for your kitchen coffee and tea station. 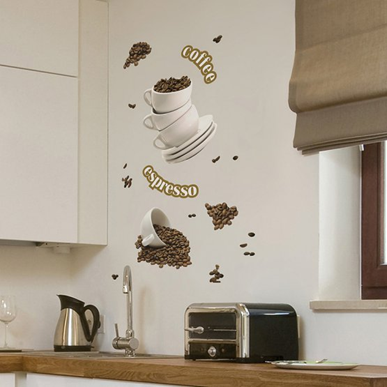 The inexpensive Coffee House Peel and Stick Wall Decals from Jet.com (codes here) give you the freedom to work with a small space and choose where you want a little flair. Imagine your station and plan out where you want these guys to go. They’re so cute and versatile. 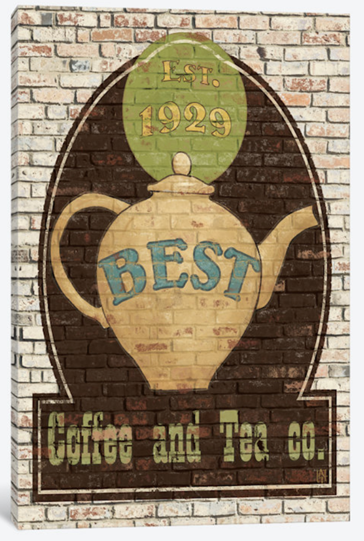 Another decal option is the Wall Pops Coffee Wall Decals from Hayneedle. Add an energetic look to your station with overstacked cups, plates, and beans flying everywhere. Plus, Hayneedle usually has a few discount codes and other coupons available. 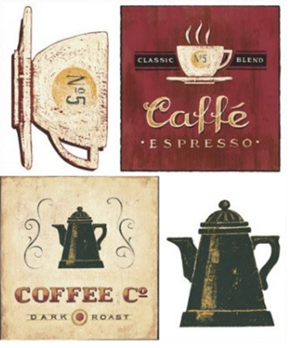 These playful decals are a fun addition above your coffee maker. 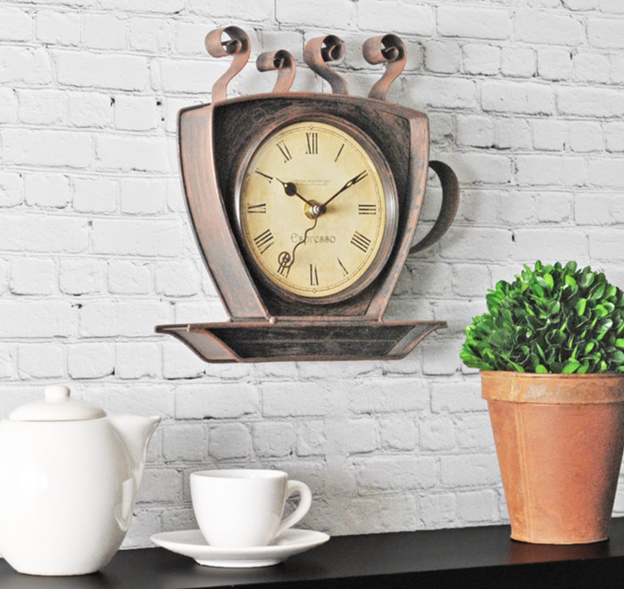 Make time for your beverage of choice with the Bronze Coffee Cup Clock from Houzz (deals here, cash back offers here). It’s kitchen coffee station art and a clock all in one. Hang this up and always know when it’s time for a hot cup of coffee. If you love all things tea, get the Types of Tea Poster from Walmart and study up on your tea knowledge. 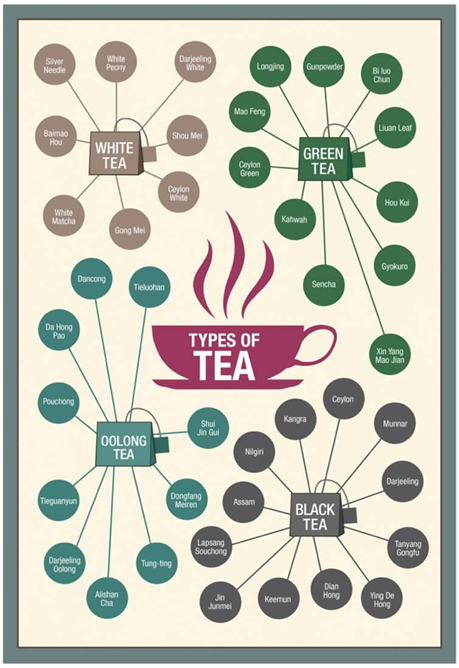 This inexpensive poster can be your daily reminder about which teas are Black, Oolong, Green, and White. It’s also just an incredibly cute piece of art for under $10 (and cheaper if you use Walmart coupon codes or other deals). Decor doesn’t have to be expensive to achieve what you’re looking for. Make your station a little morning getaway before you start your busy day. And do so by spending next to nothing!